Well on the journey to convert everything to led I started on my tails. So far I have three rings that will run on pwm so they will get brighter once the brakes are hit. This is the prototype I made using some generic led rings. I then made an array with lumileds because the generic leds are not bright enough. Generic on the sides and the lumiled in the middle. Thats all I have so far what do you guys think? where did you get the rings??? I would just make sure the underrun the Lumileds and keep them voltage regulated. Although Lumileds are quality and very hardy, they will be run in a constant on state when the running lights are on and for extended periods at stop lights which can build up heat if they're pushed too far. I presume they're the 70mA ones. I would suggest running them at 50mA with a 12v regulator. Also, AZDave at hidplanet.com sells a PWM setup that includes a voltage regulator. It's cheap and does everything you need. There is nothing cheap about doing a proper LED setup. The Lumileds and Cree P4 I used were something like $.30/each. I used approximately 500 of them for both sides. Include the boards, wiring, resistors, PWMs, regulators, and any other incidentals and you're looking at $300+. This is of course an S4 setup where I used an extreme amount of LEDs, but it is still not cheap regardless. 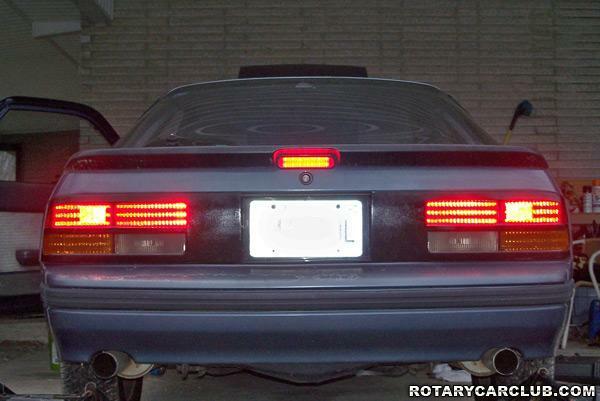 I would also not suggest skimping on cheap LEDs for tailights. Cheap LEDs don't hold up to heat nearly as well and in a taillight application where you might be standing on the brakes at a stop light for a couple minutes, heat is an issue. LEDs may last 10,000 hours in perfect conditions, but add heat in and that drops dramatically quickly. On top of that, heat causes a shift in the color spectrum that is usually less than desirable. In addition, I doubt a cheap pre-made ring is conservatively run because the need to up the amperage for increased luminosity from cheap LEDs. For the Lumileds that are rated at 70mA and you run at 50mA for a nice bright light, it's no problem. However, a cheap 50mA run at 70mA isn't going to be happy. Now for interior LEDs such as dome lights, I wouldn't have any issue using the crappy chinese LEDs on ebay. Even if their life expectancy is cut to 50 hours due to overrunning and being cheap, that's probably 20x the amount you'd ever use your dome lights. Last edited by My5ABaby; 05-18-2011 at 04:14 PM.. The cheap generic rings I bought off of superbrightleds but I am not using them for my tails they were just for prototyping they lack intensity and most likely will burn out quickly. I made the ring of lumileds it took me forever to make them in a perfect circle since the shape of the leds are square it was kinda like a puzzle lol. 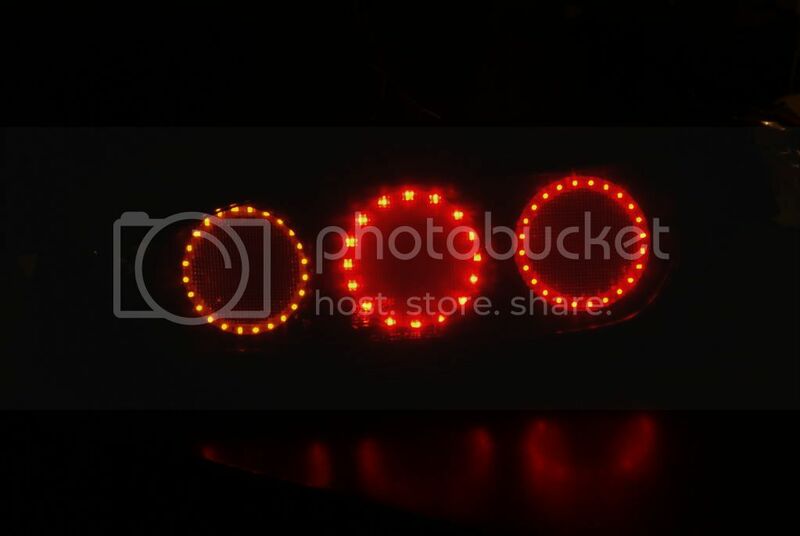 I'm not sure if it is possible to stuff more leds into the circle because of the shape of the leds. I am also using the optidrive kit from azdave. If you use a PCB then it may be hard to position them as you want. If you make your own board from scratch then you can position them any way you want. loving the s4 led tails man. get that radio in? Sure did. I just need to find the plastic surround for the headunit and it'll be complete. Here is one side done i have to turn down the brightness some so it doesn't look i'm braking all the time. Those look good. Mine are, apparently, blindingly bright. I have 240 red/orange Lumileds running at 50mA so it's a bit much when I brake. Thankfully the PWM lets me turn them down when in running light mode as you're talking about. My plan is to tint my tails and actually have visible brake lights when doing so. There's not much I hate more than tinted stock tails that I can't see in the daytime because someone is a jackass. Finally got my lights done here it is finished. i love the s4 lights. has anybody made some for the s5? 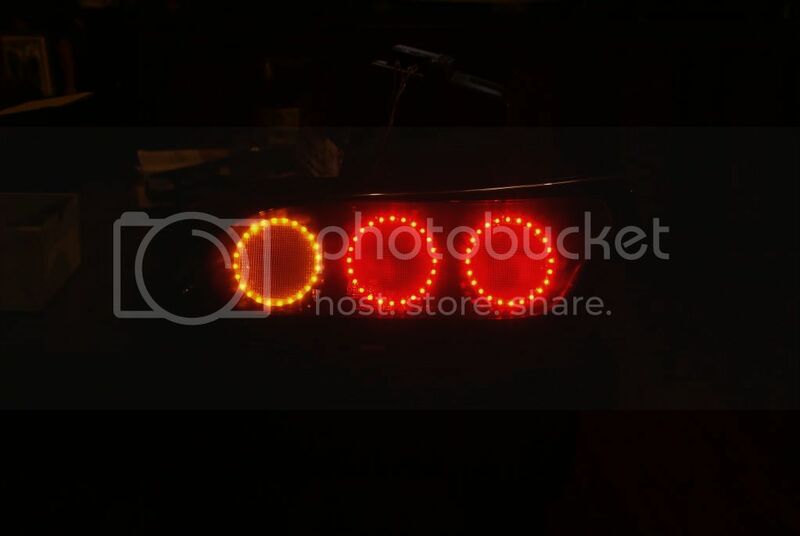 Those look better than ANY aftermarket tail light I have EVER seen, EVER.